A series of ancient Irish pilgrim paths has the potential to become the ‘pedestrian’ version of the Wild Atlantic Way if it gets the backing of a proper tourism marketing campaign, organisers have said. A new ‘passport’, like those given to pilgrims on the Camino de Santiago, has now been issued by the Heritage Council – in the hope that it will revitalise routes not widely used since medieval times. 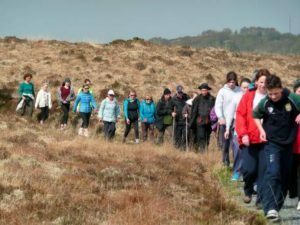 The paths comprise a 120km stretch of walking – dotted across the country – from Glencolmcille and Lough Derg in Co Donegal to the Slí Mór taking in Clonmacnoise in Co Offaly, and from St Kevin’s Way at Glendalough in Co Wicklow. John O’Dwyer, chairman of National Pilgrim Paths, explained that anyone who wants their passport stamped needs to take a ‘selfie’ at particular locations along each way to produce as evidence that they have walked the route. When all five initial paths have been completed, pilgrims can send it off to Ballintubber Abbey, Co Mayo, to get their Teastas Oilithreachta or Pilgrim’s Certificate. The first big group of around 40 Irish people from the midlands started the process to obtain their passport over the weekend, while the initiative is already attracting “a lot of interest” from overseas, revealed Mr O’Dwyer. Mr O’Dwyer said the potential was there for the walking route to become as popular and lucrative, a draw as the Wild Atlantic Way. He said the attraction of doing the Irish Pilgrim Paths over the Camino was that the weather was more conducive to walking. Meanwhile, pilgrims need to take at least 10 days in succession to complete the Camino – while the five Irish paths stand on their own and can be done individually, he said. According to Mr O’Dwyer, the paths appeal to a “growing number of people seeking to escape the daily grind of life and take some time out for reflection while enjoying the great outdoors”. Pilgrims travelled to Ireland from Hungary, France, Italy and Holland throughout the 14th and 15th centuries, when the sites of pilgrimage were of huge significance at a European level and the Irish roots of Christianity remain widely acknowledged to this day. More than 250,000 people walked the Camino de Santiago in Spain last year. The Camino Frances is the favourite Camino route, with 67pc of pilgrims walking the route. You can read the full article on the Irish Independent.